Landing pages are very important because they provide visitors with a good first impression about your site. They are the front-liners of your website, as they’re basically the website’s homepage and the first thing visitors will see after clicking on a hyperlink. It’s essential that you use a reliable landing page template for the task. You should also ask yourself if the landing page is “easy-to-use” or not? Ease plays a huge factor for a lot of visitors. It’s best that you use an efficient and stylish landing page. 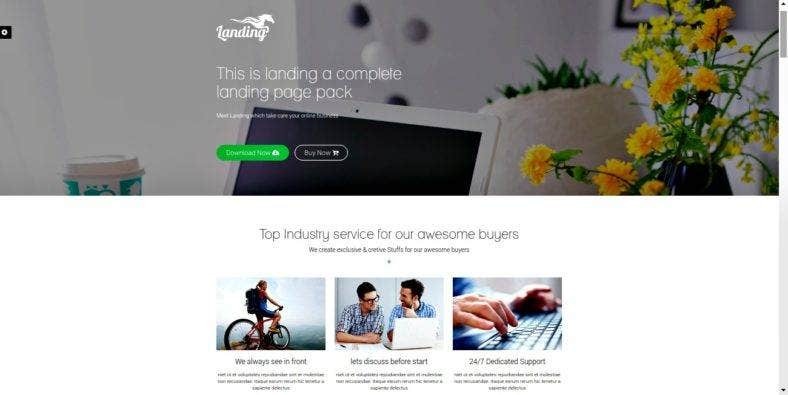 We’ve prepared 10 business landing page templates below that you’ll surely find to be the best. We’ll kick things off with Qloudify. This is one of the most reliable HTML business templates that anyone can definitely use for their benefit. It is jam packed with features such as Cufon font replacement, working contact form and Jquery fancybox, cycle plugin, Nivo Slider, and scroll to. It also comes in two different variations, with each of them having five color styles. Additional features are the five sliced PSD and well-layered files. You can definitely think about a lot of use for this landing page sample and you can also tweak it as much as you like, so it would fit your needs. This landing page sample is one of the many templates that Intense made. They have an immense UI kit, free updates for life, over 300 PSD files, and a PSD app template. It has a Bootstrap version of 3.2.0, a contact form and its animation runs using HTML plus JS. It also has additional features like Google Web Fonts, sliced PSD and cross-browser compatiblity. Programming languages include Jquery, CSS 3, Sass, HTML 5, Valid Coding, and Semantic Code. Overall it’s a pretty efficient and reliable landing page. This one is not your everyday landing page as it is filled with very important features that will make life easier for its users. It has three unique landing page concepts that will definitely amaze. SEO, or Search Engine Optimization, is very important for a landing page template, as this will help them become searchable in search engines like Google, Bing and Yahoo. This website theme has an advanced SEO option integrated into it, which will improve your site’s SEO rank. Editing and exporting files are very easy and simple that even the least techie one would still be able to use it. The Times is a software landing page template that allows its users to use Facebook as a means of marketing and advertising. 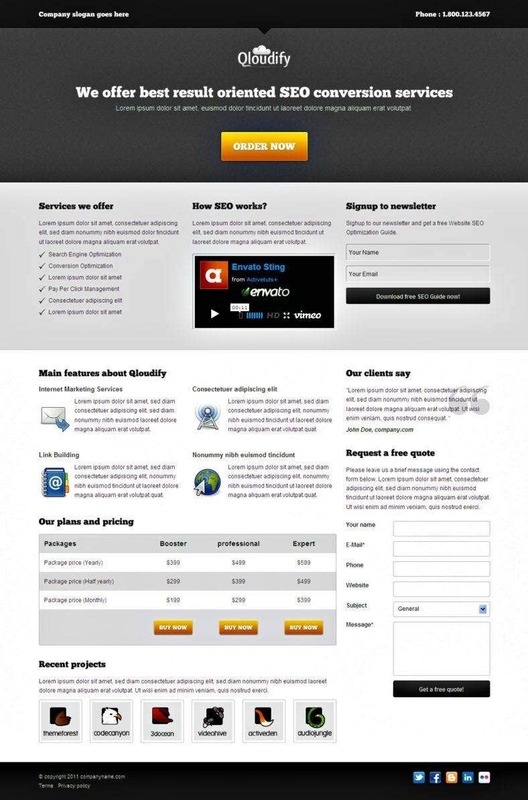 It also helps in enhancing the user’s conversion rate as it would attract visitors to the site. Another amazing thing about this landing page is its capability to track the numerous customers that you have. Tracking every single one of them could prove to be a daunting task, but with the help of this template, you won’t have to worry about that anymore. You’d have more time to focus on other aspects of your business and site, which would make it grow even more. Cornet is one of the most reliable free landing page template available in the market today. It has all the right features that a person could ever ask for. Things like custom sidebars, social share bar, and readily available custom widgets. Its interface is also user-friendly, visceral, and has plenty of useful tips. Additional features include a dynamic content loader, translation options, anti-spam capabilities, shortcodes, and customizable menu buttons. Its SMT Framework runs on version 2.0 and if you’d want to categorize related posts together, it lets you color all of them in multiple hues, making it easier for you to identify the ones with similar content. 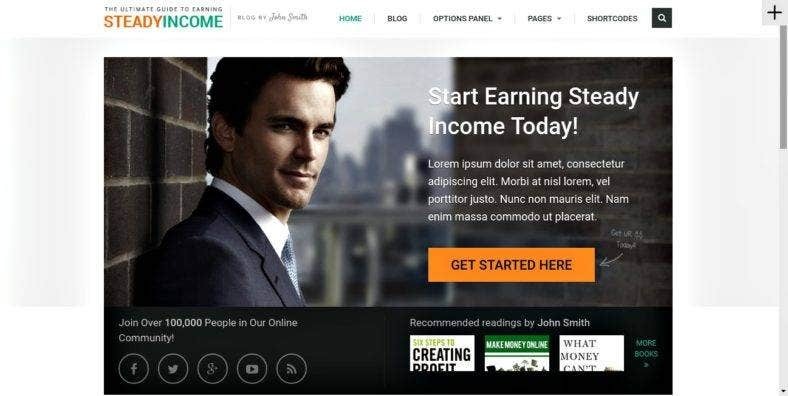 SteadyIncome may look like a simple landing page that has nothing new to offer. However, one simply needs to use it first, for them them to know the full benefit they can reap from it. One of the reasons why this is such a brilliant HTML landing page theme, is because of its 100% responsiveness. It can automatically optimize itself for any size or any type of display screen. It also shows, on the front page, your site’s latest content. Sharing anything has been made simple since famous social media sites are linked to it, making it a mere click away. You’re not just going to handle finances, expenses, incomes, and taxes in your business every day. One of the tasks that you’ll be doing is to offer up consultation services. This is especially true if consultation is your profession. 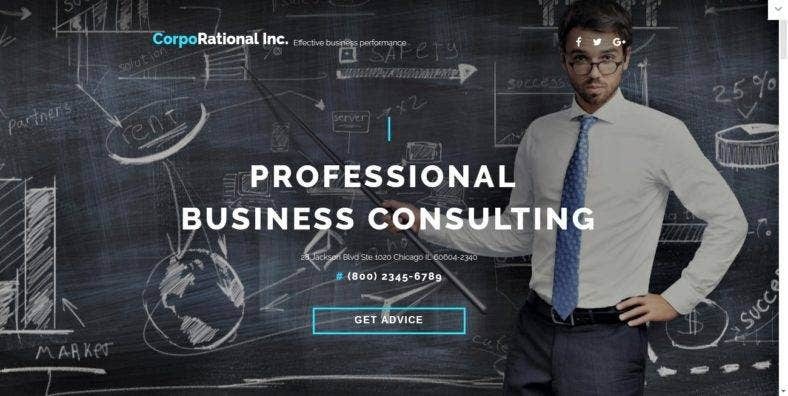 CorpoRational Inc.’s business consulting landing page template will definitely help you map out your website and shape it the way you desire. With features like cross-browser compatibility, valid semantic coding, a concise contact form, and the use of Parallax, your visitors will definitely find themselves gravitating towards your site. You’d then be able to garner customers, which means more revenue for you. You shouldn’t just settle with any kind of landing page that you find. Instead, you should look for the one that best suits your needs and use it. 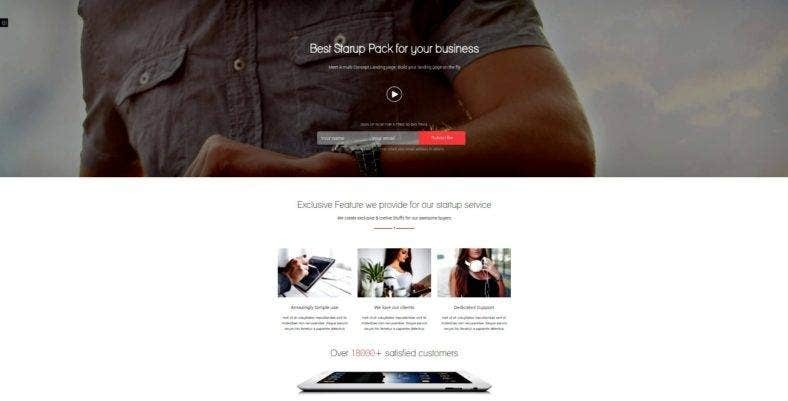 You should be looking for premium landing page templates with a variety of useful features like unlimited domain hosting, elements of E-Commerce, free website scripts, and responsive display support. 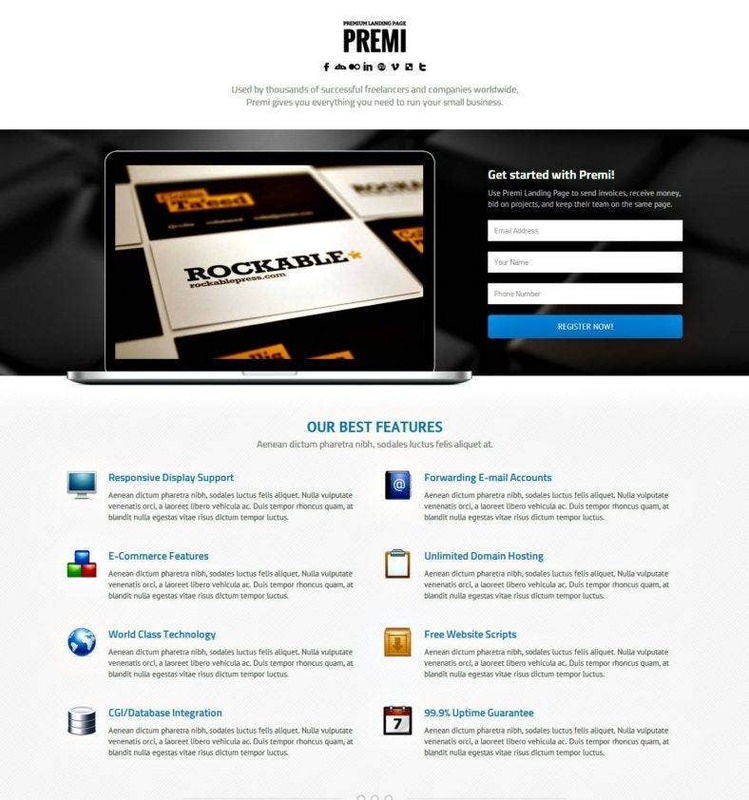 Premi has all of these things, is also HTML 5 valid, SEO-friendly, utilizes a 1200 grid system, has 6 colors option, and has 2 slider layouts. It can also be added to your collection of mobile landing page templates since it’s tablet and mobile ready. Although its name may suggest otherwise, there is certainly nothing modest about this landing page. 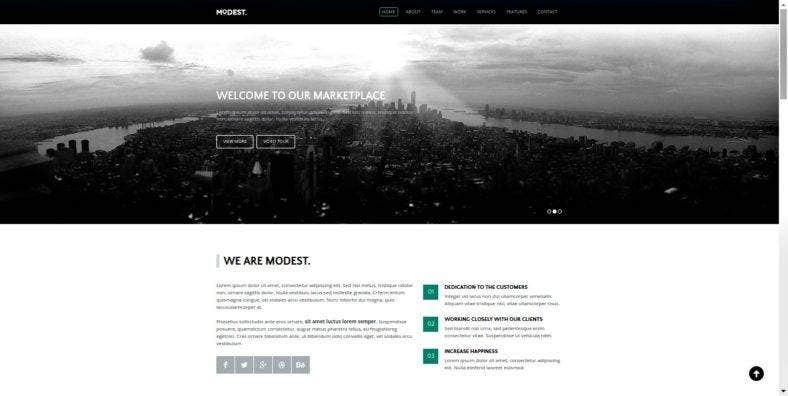 Modest is one of the many responsive landing page templates that is perfect for corporate and personal use. Its layouts have a relaxing appeal, and the aesthetics that it utilizes will certainly provide users with a comfortable feeling during their visit. It is definitely one of the best marketing landing page themes out there, all thanks to features like: high-resolution slider images; social network icons accessibility; integrated contact form; SEO- and semantic-friendly markups; as well as customizable backgrounds and logos. The template is also optimized for tablet and mobile devices. With the ability to cater different devices—be it a computer, mobile, or tablet—Landing is definitely one of the most amazing app landing pages in the market. It has amazing features such as Bootstrap 3.3, high-quality responsiveness, cross-browser capabilities, and built-in extensions. Aside from that, it also has sensational sleek icons, it fully documents all of the information that you’d want to save and it is also flexible and modular, able to automatically adjust to functions like mobile optimization. To make sure it caters all of the customer’s needs, it also has a 24/7 support for technical and other issues. Thanks to the advancement in technology, reaching out to other people has now become easier. We get connected no matter where we are in the world. It is also due to this that marketing strategies have evolved and have now reached a wider audience. Which is why you should take full advantage of it and aim to make the best out of Internet marketing landing page templates. Landing pages are still considered as business templates because they aim to endorse your product or service. But they’re not just for business purposes because bloggers and other people can use them too. 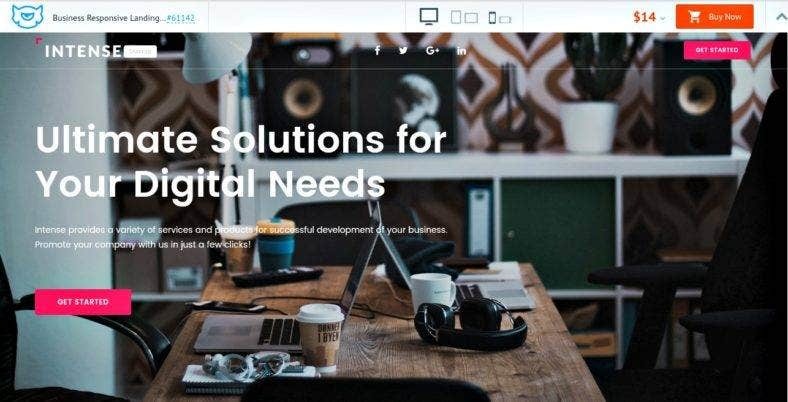 The benefit of showcasing what a company or an individual has to offer can be grasped by anyone who wants to use a landing page should they need such a platform to help them in their endeavors.